Ciaron Maher trained Group 1 winning entire Bon Aurum will become the fifth major winner to start a stallion career in Victoria this season. Glen Eden Agistment in conjunction with Ken King Thoroughbreds has announced that the four-time stakes winning stallion will be stationed at the growing Kilmore stud. Bon Aurum won four black-type races including the Group 3 Caulfield Guineas Prelude as a 3YO and then the time honoured Group 1 Sir Rupert Clarke Stakes over 1400 metres as a four-year-old. He will stand at Glen Eden alongside other resident stallions, Al Samer, Illustrious Blue and Scintillo. Sonia O’Gorman, manager of Glen Eden, is thrilled to have such a great opportunity. Having worked for more than twenty in the thoroughbred industry, including at Hunter Valley and Victorian stallion studs, Sonia is progressively building her operation and Bon Aurum’s recruitment is a big milestone. “He ticks all the boxes to become a great sire. He won as a two-year-old, his wins were from 1200 metres to 1400 metres and he is a Group 1 winner and a four-time stakes winner,” O’Gorman said. “As a bonus he is also an impressive looking individual standing at 16.1 hands. He has great presence, scope, strength and correct conformation all attributes to compliment producing good racehorses as well as impressive yearling types for the sales. Bon Aurum is free of Danehill making him a great option for many mares in Australia. 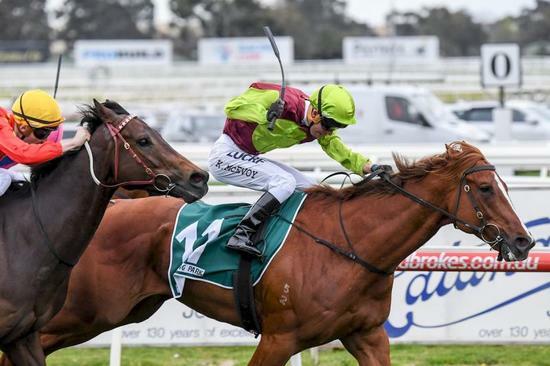 Trained by Caulfield based Ciaron Maher, Bon Aurum was held in high regard with the stable professing he was an impressive racehorse with a great temperament. “Bon Aurum was a tough horse with a remarkable will to win! He was trained on from being a two-year-old winner to be a dual stakes winner at three before winning a Group 1 in the spring Carnival of his four-year-old career,” Maher enthused. Prolific owner Ken King, who bred Bon Aurum by his stallion Bon Hoffa, rates him better than his sire both on type and track performance. “Bon Hoffa has been a great stallion for owner-breeders who want to produce a top-class racehorse at a reasonable price and we are confident his Group 1 winning son Bon Aurum can emulate and even better his deeds,” King said. In fact, at a service fee of $5,500 (GST incl), Bon Aurum is the only Australian Group 1 winning first season sire in 2018 standing for less than $10,000. For more information on Bon Aurum or the other Glen Eden stallions, contact Sonia O’Gorman on 0407 811 411 or email glenedenagistment@bigpond.com or visit www.gleneden.com.au.